Alan and Linda’s pond has pride of place in their back garden in front of the conservatory. It is kidney shaped, 18ft x 8ft x 6ft and holds 6,000 gallons. 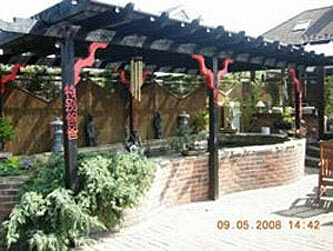 A pergola provides shade and protection for the koi. 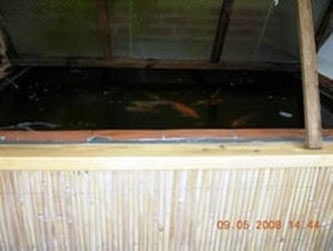 The pond is constructed of concrete blocks, back filled with concrete and rods, it is approximatlely half above and half below ground. The pond is rendered and fibre glassed. It was built by Alan with the help of club members and good friends Ray, Lee and Jim. Two bottom drains feed the filteration system through 4ins pipework. The returns are by two1½ins pipes. 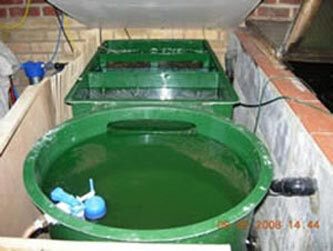 The filter system consists of a Vortex which feeds into two 4 bay Kockney Koi filters with brushes and Jap matts. 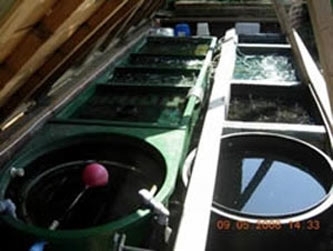 Two Aquamax 1,000 pumps return the water to the pond via two 25 watt UV systems and the vegatable filters which are situated to the side of the pond, between the pnd and filter area. Aeration is provide by two Medo air pumps, a 45 and an 80. 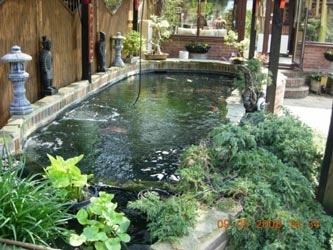 The pond has two wide mouthed skimmer units powered by an Aquamax 1,000 pump. 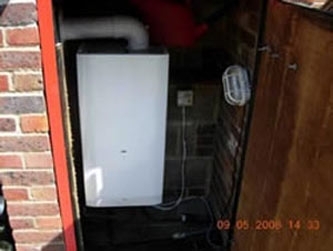 The pond is heated in the colder months by a gas boiler located in the boiler house next to the pond.